Lightsaber Glove Holster Tee Design Review. The Lightsaber Glove Holster tee design is for any aspiring Jedi that lives, eats, and craps Star Wars. 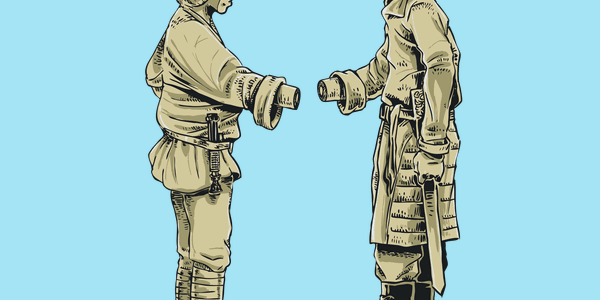 The Lightsaber Glove Holster tee design concept is a fake ad based on the fact that the Jedi are always dropping their Lightsabers during epic battles. As mentioned with the text "Despite being a trained Jedi I was always dropping my Lightsaber, adding dramatic effect to my battles. Thanks, Lightsaber Glove Holster! ~ O.W. Kenobi". The glove is shown to be endorsed by both Yoda and Obi Wan Kenobi who each give it a thumbs up approval as seen in the circle insert. As for the artwork, the design is a cartoon illustration with retro coloring and minor hatching for some minimal shading on select parts. The style looks like it belong on Cartoon Network. 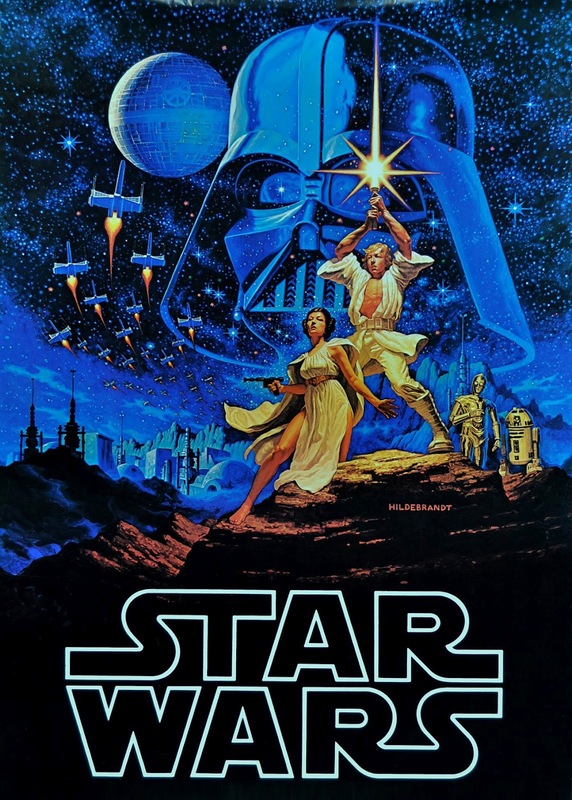 The font is done in the Star Wars logo styling. This Lightsaber Glove Holster tee will make a nice gift for any fan of Star Wars and practicality. This is a good casual shirt that fits in anywhere but it will a hit at Comic-Cons, Sci-Fi Conventions, and other similar events. Lightsaber Glove Holster Tee Design by glenbrogan. Chewbacca’s Glamor Shot Tee Design Review. 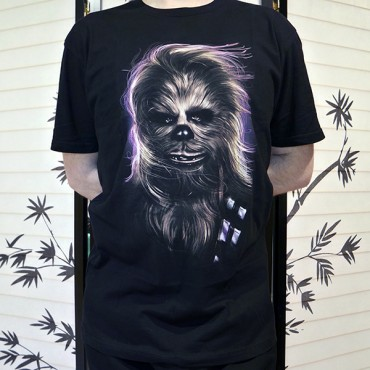 The laughter inducing Chewbacca's Glamor Shot tee design is for the Star Wars fans that read way too many romance novels. 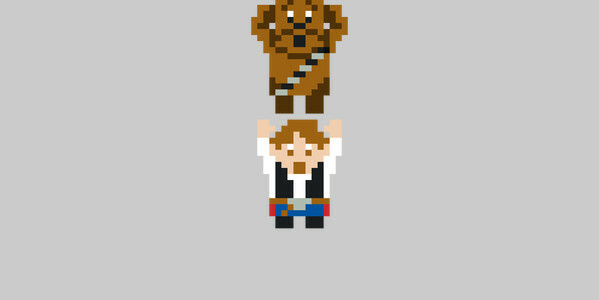 Just kidding but anyone that wants to be a Wookie magnet might want to consider this as part of their wardrobe. 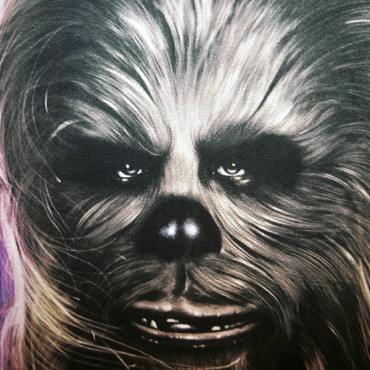 The concept for the Chewbacca's Glamor Shot Tee is basically to treat Chewbacca like Fabio Lazoni and glam him up. With his fur waving in the air and that 80's Purple background topped off with that smug look upon his face Chewbacca is model that would give Right Said Fred a run for his money when it comes to strutting. 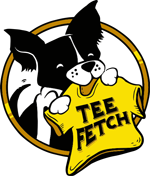 As for the artwork, it is an officially licensed tee and it is as professional as it gets from the coloring, shading, and even textures. It takes a confident man with a strong sense of humor to pull off a shirt like this. Or at the very least a really devoted Star Wars fan. 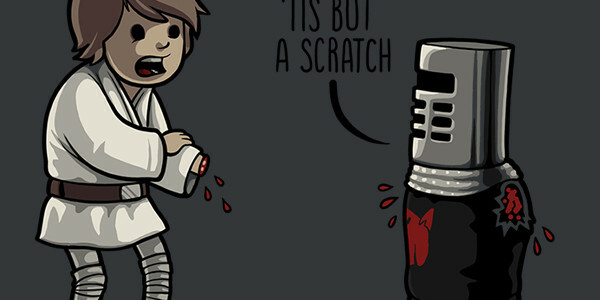 But seriously any Star Wars fan would like to have this tee as it is hilarious. 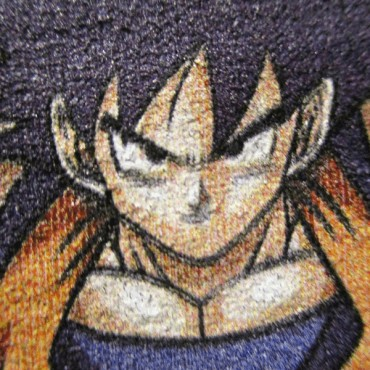 The print didn't turn out as vivid as the thumbnail, as you can see in the comparison this is especially true with Brown fur and the Purple halo. It is still worth the money. Chewbacca's Glamor Shot Tee Design. 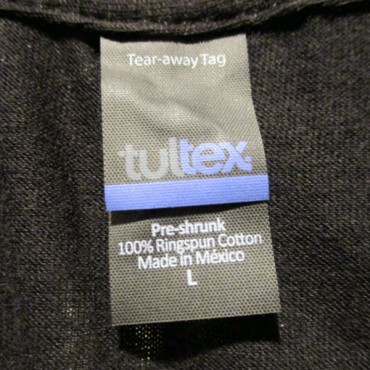 Type Star Tee Design Review. The Type Star tee design is for Star Wars fans. For The concept, this takes the first 6 episode opening crawls and arranges them in the shape of the Death Star. 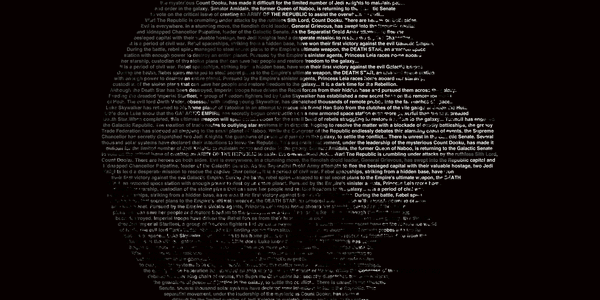 This design took a lot of patience to make even if it was done as an overlay layer on top of a Death Star base image (which gets removed) and the shading is done by changing the color of the font thus creating some depth. Here are parts of the crawls to give you an idea of what is typed. Episode I: The Phantom Menace: "Turmoil has engulfed the Galactic Republic. The taxation of trade routes to outlying star systems is in dispute. Hoping to resolve the matter with a blockade of deadly battleships, the greedy Trade Federation has stopped all shipping to the small planet of Naboo. While the Congress of the Republic endlessly debates this alarming chain of events, the Supreme Chancellor has secretly dispatched two Jedi Knights, the guardians of peace and justice in the galaxy, to settle the conflict...."
Episode II: Attack of the Clones: "There is unrest in the Galactic Senate. Several thousand solar systems have declared their intentions to leave the Republic. This separatist movement, under the leadership of the mysterious Count Dooku, has made it difficult for the limited number of Jedi Knights to maintain peace and order in the galaxy. Senator Amidala, the former Queen of Naboo, is returning to the Galactic Senate to vote on the critical issue of creating an ARMY OF THE REPUBLIC to assist the overwhelmed Jedi...."
Episode III: Revenge of the Sith: "War! The Republic is crumbling under attacks by the ruthless Sith Lord, Count Dooku. 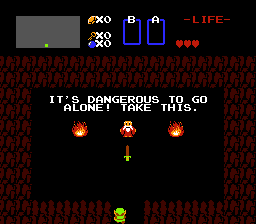 There are heroes on both sides. Evil is everywhere. In a stunning move, the fiendish droid leader, General Grievous, has swept into the Republic capital and kidnapped Chancellor Palpatine, leader of the Galactic Senate. As the Separatist Droid Army attempts to flee the besieged capital with their valuable hostage, two Jedi Knights lead a desperate mission to rescue the captive Chancellor...."
Episode IV: A New Hope: "It is a period of civil war. Rebel spaceships, striking from a hidden base, have won their first victory against the evil Galactic Empire. During the battle, Rebel spies managed to steal secret plans to the Empire's ultimate weapon, the DEATH STAR, an armored space station with enough power to destroy an entire planet. 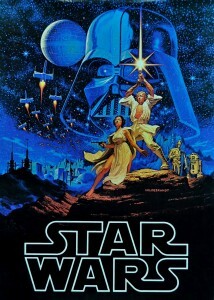 Pursued by the Empire's sinister agents, Princess Leia races home aboard her starship, custodian of the stolen plans that can save her people and restore freedom to the galaxy...."
Episode V: The Empire Strikes Back: "It is a dark time for the Rebellion. Although the Death Star has been destroyed, Imperial troops have driven the Rebel forces from their hidden base and pursued them across the galaxy. Evading the dreaded Imperial Starfleet, a group of freedom fighters led by Luke Skywalker has established a new secret base on the remote ice world of Hoth. The evil lord Darth Vader, obsessed with finding young Skywalker, has dispatched thousands of remote probes into the far reaches of space...."
Episode VI: Return of the Jedi: "Luke Skywalker has returned to his home planet of Tatooine in an attempt to rescue his friend Han Solo from the clutches of the vile gangster Jabba the Hutt. Little does Luke know that the GALACTIC EMPIRE has secretly begun construction on a new armored space station even more powerful than the first dreaded Death Star. 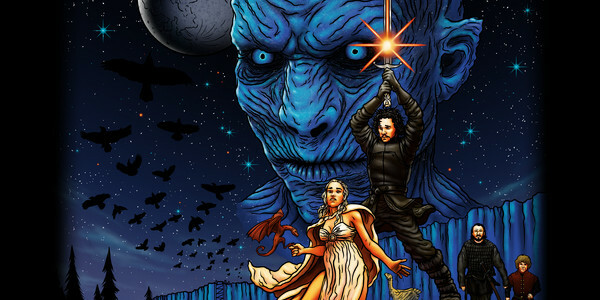 When completed, this ultimate weapon will spell certain doom for the small band of rebels struggling to restore freedom to the galaxy..."
As for the Type Star Tee artwork, the font colors are appropriately Death Star tones. The Type Star tee design is perfect for wearing to screenings of Star Wars, or while attending Comic-Cons and so on and so forth. Type Star Tee Design by Cattoc_C. Star Wars The Force Awakens Tees. Well, Dec. 18th is almost here and the world is anticipating Star Wars The Force Awakens. To celebrate here are some links to some awesome Force Awakens and Star Wars designs in general that are worth the coin. We are focusing on two brands for two reasons. 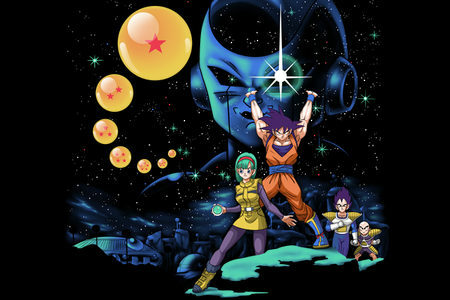 The first being Officially Licensed designs and the second being Indie designs. 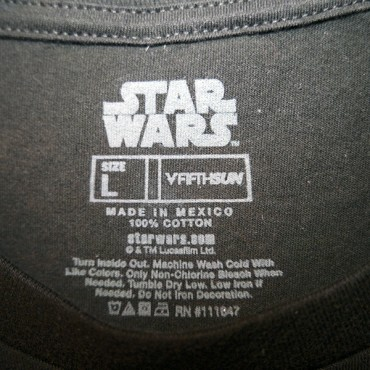 Officially Licensed Star Wars Tees. 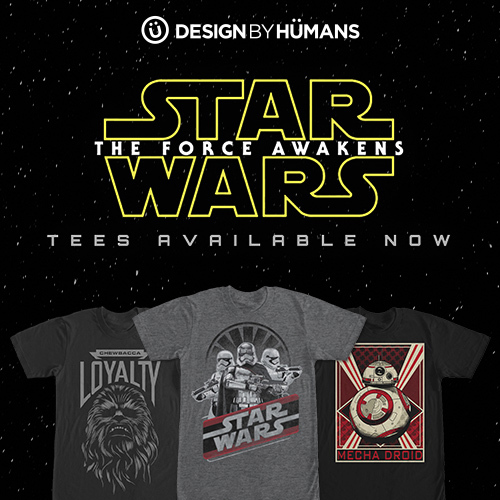 For the Officially Licensed Star Wars The Force Awakens Tees you need to go no further than DesignByHumans. 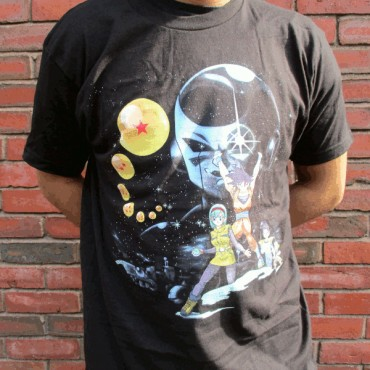 A wide selection of designs that cover every episode of the famed space opera. 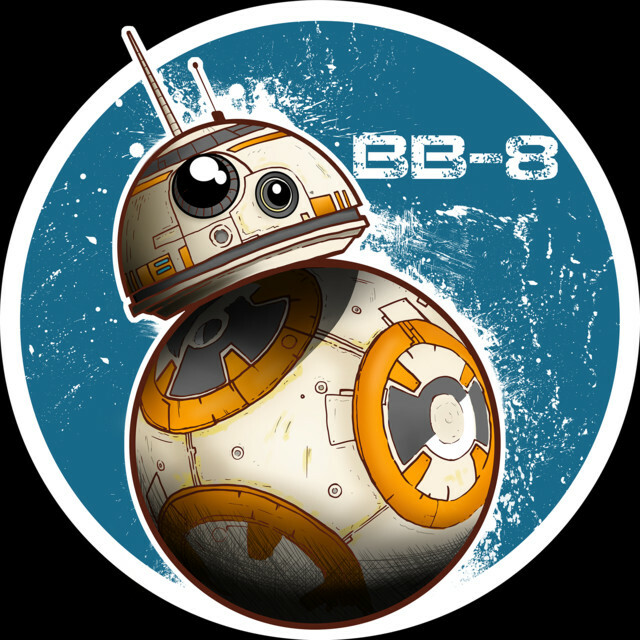 The simple but effective BB-8 On The Move tee design will be a favorite for kids of all ages. 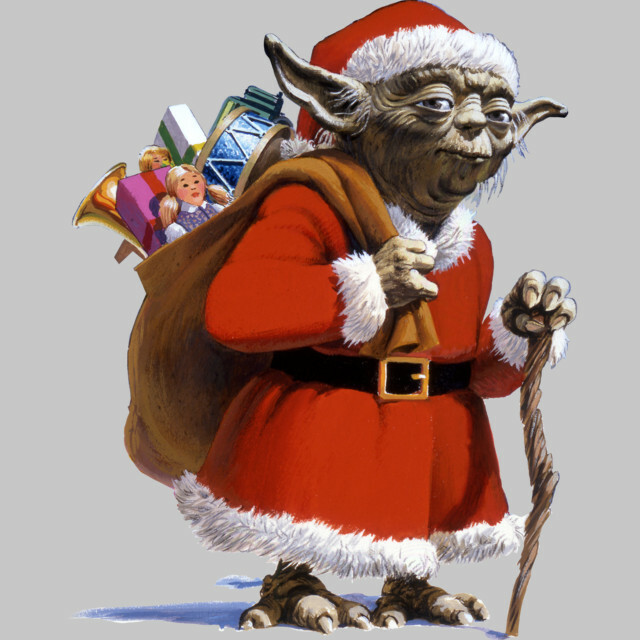 The Santa Yoda tee for example is a hilarious nod to episodes past. 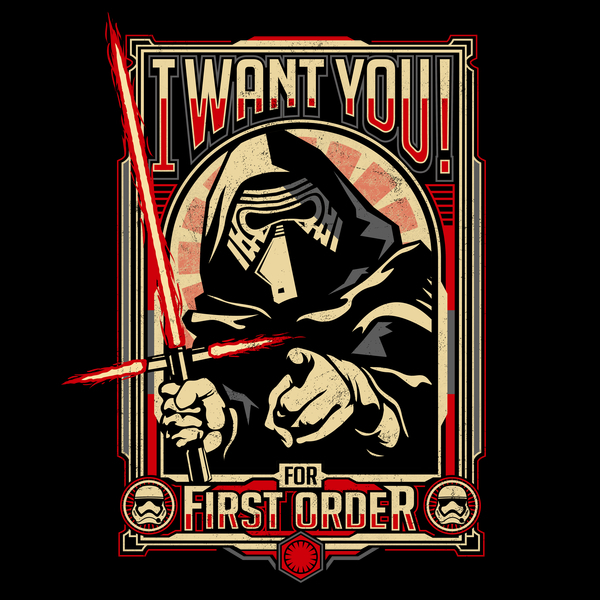 If indie designs are more your thing then fan made goodies from NeatoShop such as I Want You For The First Order tee will be sure to please. It is a proper piece of Sith Propaganda that will bring out the Dark Side of anyone even remotely tempted. 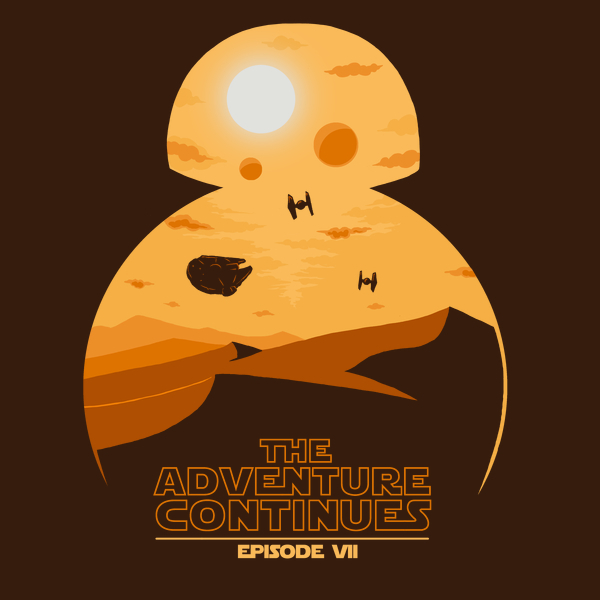 For more of a Jedi vibe consider The Force Awakens tee design. That is just a quick look at a few Star Wars The Force Awakens tees available that get our nod of approval for quality purchases. Head on over to those sites and see what you like for yourself or someone else. After all, Christmas is just around the corner as well.